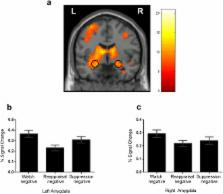 The present functional magnetic resonance imaging study investigated how trait neuroticism and its heterogeneous subdimensions are related to the emotional consequences and neural underpinnings of emotion regulation. Two levels of neuroticism assessments were conducted with 47 female subjects, who were required to attend to, suppress emotion displays to, or cognitively reappraise the meanings of negative images. The results showed reduced emotional experience and bilateral amygdala activation during reappraisal, and this regulation effect is unaffected by individual differences in neuroticism and its subdimensions. By contrast, the emotion downregulation effect of suppression in the right amygdala is compromised with increasing self-consciousness but not overall neuroticism dimension. This association holds robust after controlling the potential contribution of habitual suppression. Moreover, the psychophysiological interaction (PPI) analysis revealed that self-consciousness predicts weaker functional coupling of the right amygdala to supplementary motor area and putamen during expressive suppression, two regions mediating the control and execution of motor actions. These findings suggest that self-consciousness predicts increased difficulty in emotional regulation using expressive suppression; and that the heterogeneous nature of trait neuroticism needs to be considered in exploring the association of neuroticism and emotion regulation. Automated anatomical labeling of activations in SPM using a macroscopic anatomical parcellation of the MNI MRI single-subject brain. An anatomical parcellation of the spatially normalized single-subject high-resolution T1 volume provided by the Montreal Neurological Institute (MNI) (D. L. Collins et al., 1998, Trans. Med. Imag. 17, 463-468) was performed. The MNI single-subject main sulci were first delineated and further used as landmarks for the 3D definition of 45 anatomical volumes of interest (AVOI) in each hemisphere. This procedure was performed using a dedicated software which allowed a 3D following of the sulci course on the edited brain. Regions of interest were then drawn manually with the same software every 2 mm on the axial slices of the high-resolution MNI single subject. The 90 AVOI were reconstructed and assigned a label. Using this parcellation method, three procedures to perform the automated anatomical labeling of functional studies are proposed: (1) labeling of an extremum defined by a set of coordinates, (2) percentage of voxels belonging to each of the AVOI intersected by a sphere centered by a set of coordinates, and (3) percentage of voxels belonging to each of the AVOI intersected by an activated cluster. An interface with the Statistical Parametric Mapping package (SPM, J. Ashburner and K. J. Friston, 1999, Hum. Brain Mapp. 7, 254-266) is provided as a freeware to researchers of the neuroimaging community. We believe that this tool is an improvement for the macroscopical labeling of activated area compared to labeling assessed using the Talairach atlas brain in which deformations are well known. However, this tool does not alleviate the need for more sophisticated labeling strategies based on anatomical or cytoarchitectonic probabilistic maps. A probabilistic framework is presented that enables image registration, tissue classification, and bias correction to be combined within the same generative model. A derivation of a log-likelihood objective function for the unified model is provided. The model is based on a mixture of Gaussians and is extended to incorporate a smooth intensity variation and nonlinear registration with tissue probability maps. A strategy for optimising the model parameters is described, along with the requisite partial derivatives of the objective function. An automated method for neuroanatomic and cytoarchitectonic atlas-based interrogation of fMRI data sets. Analysis and interpretation of functional MRI (fMRI) data have traditionally been based on identifying areas of significance on a thresholded statistical map of the entire imaged brain volume. This form of analysis can be likened to a "fishing expedition." As we become more knowledgeable about the structure-function relationships of different brain regions, tools for a priori hypothesis testing are needed. These tools must be able to generate region of interest masks for a priori hypothesis testing consistently and with minimal effort. Current tools that generate region of interest masks required for a priori hypothesis testing can be time-consuming and are often laboratory specific. In this paper we demonstrate a method of hypothesis-driven data analysis using an automated atlas-based masking technique. We provide a powerful method of probing fMRI data using automatically generated masks based on lobar anatomy, cortical and subcortical anatomy, and Brodmann areas. Hemisphere, lobar, anatomic label, tissue type, and Brodmann area atlases were generated in MNI space based on the Talairach Daemon. Additionally, we interfaced these multivolume atlases to a widely used fMRI software package, SPM99, and demonstrate the use of the atlas tool with representative fMRI data. This tool represents a necessary evolution in fMRI data analysis for testing of more spatially complex hypotheses. Verbal and nonverbal emotional memory following unilateral amygdala damage.